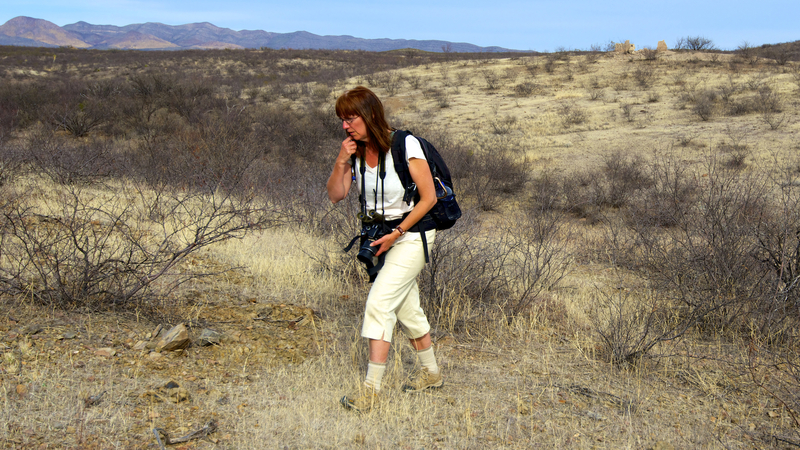 Amy hikes across the desert near Tombstone after leaving the Brunkow cabin, seen on the hill in the right background, where John Van Houten was killed by Frank Stilwell. “You know, it matters. It matters that we have come to this place and paid some kind of homage to this Barkervillian, to Colonel John Van Houten who had his face bashed in, until he was dead, by Frank Stillwell. It matters because no one in Barkerville even knows his name. "We have to shoot that," Amy said. "You have to say it again." 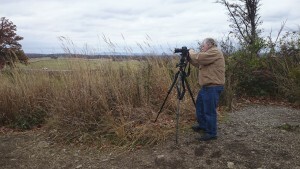 Richard filming the Diller story at Gettysburg, PN. RCW photo. The Bonepicker: Cariboo Gold Rush Backstories is a series of mini-documentaries telling the backstories, the hidden stories, the later stories, of the men and women who made the British Columbia Cariboo Gold Rush and Barkerville such a significant part of their lives. We know the men and women who were here on Williams Creek, but where did they come from? Who were they? Where did they go? Their stories did not begin or end here in Cariboo and unearthing their full story makes their life and our understanding of them more complete. Who knew that Cariboo's Doc Keithley of the famed Keithley Creek later ran for mayor in Deadwood in the Black Hills? Who knew that Capt Jack Crawford, a former partner of Buffalo Bill Cody lived in Barkerville for a year and wrote poems about the people of this place? Or that Cariboo miner Col. John Van Houten was murdered in Tombstone by Wyatt Earp's nemesis Frank Stilwell and mill owner and Cariboo miner John Adams shot a constable in Tombstone? These stories and more are the basis of the Bonepicker project. Phase 1 - $2500 - Complete - The Indiegogo campaign exceeded its goal. Have this Bonepicker website built. Film and edit two trailers, one short film and an introduction, with two more in process. Begin the I.P. Diller story at Williams Creek and Gettysburg, PN. Shoot "B-roll" backgrounders in Cariboo. Nellie Cashman's story - a Cassiar miner who mined in Nevada, lived in Tombstone and knew all the above men. Cariboo Miners in the White Pine strike at Elko, NV and Bannack MT. This phase is under development with a long list of potential back stories. The goal of this project is to tell and preserve the miner's stories and in so doing promote Barkerville Historic Town. For those interested in this important part of Canadian history these short videos will tell more of the Canadian story and give a deeper understanding of the people and their time. Links will be made between a variety of websites, such as the Barkerville website and other historic sites. DVDs will be available to promote Barkerville and its people. Barkerville Historic Town has weighed in with a major sponsorship for the final phase. They will sponsor the production of DVDs to go to schools. We will now look for specific funding for mailing and packaging. A great step forward. The risks are few, the challenges surmountable. The research is ongoing but many stories are unearthed. This project is turning up exciting new research. The major challenge is funding in a depressed heritage economy. This is where you can help. Dollars and support will make this happen. Having produced 11 years of theater in declining economic time; having written and published 23 books; and having filmed 14 half-hour films for CBC in the past, the proponents have a solid track record. If you cannot contribute you can still help by passing the word to those who can. Make some noise for us! Or, perhaps you or your business can offer in-kind support or services from fuel to film (digital! ), from RVs to editing. You or your company may wish to support one particular story. We are looking for potential corporate sponsors for episodes. If you have an idea for distribution, sponsorship or research drop us a comment. Your financial support will make this happen. To contribute please go to the Support this Project page. Hello, I just wanted to let you know that I have used some of your information regarding Col. John Van Houton (with credit) and shared your link to your blog and this site. I am also updating the Boothill site – http://www.tombstoneboothill.com and it will also be on that site.